Addiction can strike anywhere and in any community, including ours — we have watched heroin use and seriously life-threatening addictions become more common. Our community, like many across the country, is learning this first-hand with a dramatic rise in the cases of drug abuse, addiction, overdoses and deaths. 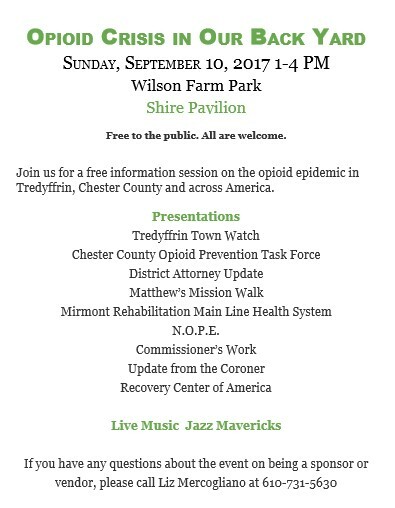 Learn about the “Opioid Crisis in Our Back Yard” on Sunday, September 10, 1-4 PM at Wilson Farm Park in Chesterbrook. A free informational session, open to the public, please plan to attend. 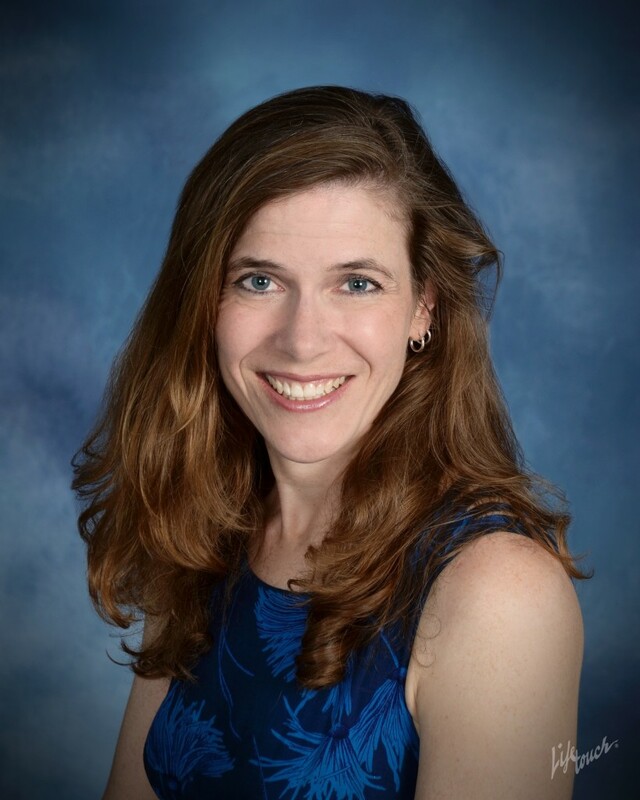 Like many multi-tasking moms, Berwyn resident Kristen Conrad has a busy life managing her full-time day job as a researcher with parenting responsibilities to two T/E School kids – one a middle schooler and the other at Conestoga HS. However, Kristen doesn’t let life’s balancing act. between family and job, keep her from her other passion … music. 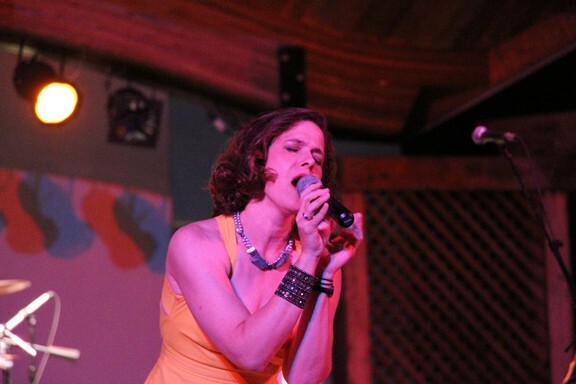 In the evenings and on weekends, Kristen, a classically trained musician, sings at weddings, church services and performs with Vox Ama Deus, a performing ensemble that specializes in Renaissance, Baroque and Classical musical styles. But … there is more to Kristen’s musical pursuits and it’s her ‘Rocker Mom’ persona that intrigues me most! Kristen is a singer and keyboardist with Cool Confusion, a rock cover band playing music that spans the 60s to the present. With emphasis on music from the 70s and 80s, the band covers a variety of musical styles, including classic and modern rock, funk, new wave, and classic R&B/Motown. Performing with Cool Confusion for twenty years, Kristen is the band’s only female mu sician. The Media-based band has played throughout Pennsylvania, New Jersey and Delaware in bars/restaurants, casinos, weddings, parties and private events since forming 1992. Other band members include Lou Brechemin (guitar and vocals), Jeff Gabriel (vocals and guitar), Ray Guy (drums and vocals) and Jim Laguna on bass. Here’s some local trivia, anyone remember Dylan’s, the bar and restaurant in Chesterbrook? If so, you may have heard Cool Confusion, one of Dylan’s regular bands. Without many places in the area with live music, there’s little opportunity to hear the rock and roll sounds of Kristen and her band. However, that is about to change! 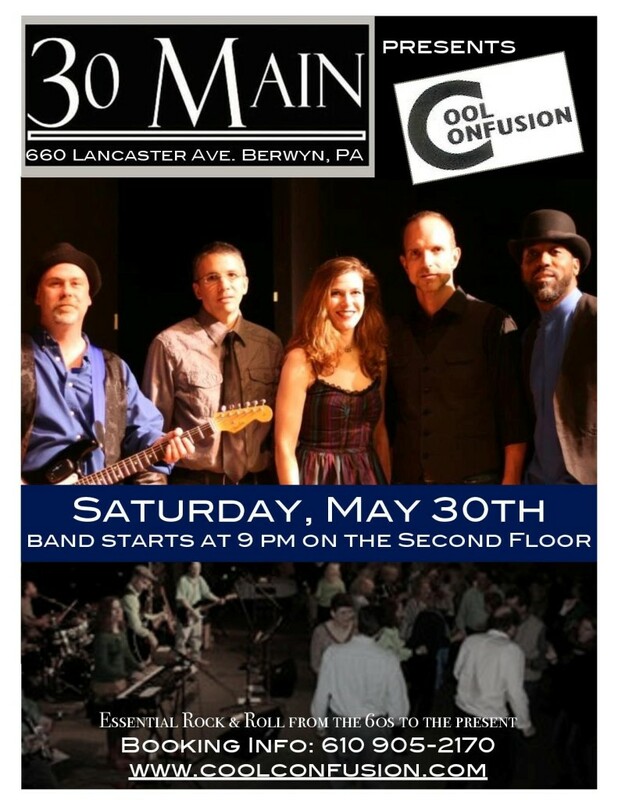 Cool Confusion is performing at 30 Main, (660 Lancaster Ave, Berwyn) in the “The Second Floor” this upcoming Saturday, May 30, 9 PM – 1 PM. $10 cover, but cover is reduced to $5 and you get 10% off your dinner bill if patron dines in 30 Main restaurant. Another opportunity to hear Cool Confusion locally is at Wilson Farm Park in Chesterbrook this summer. 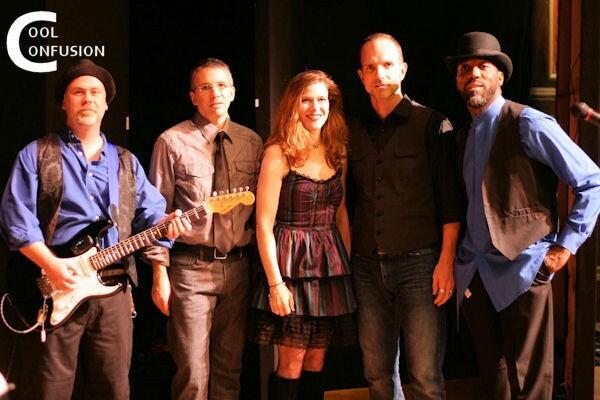 Performing at Shire Pavilion on Thursday, July 9, 7 PM – 9 PM, Cool Confusion is participating in Tredyffrin Township’s 2015 Summer Concert series. All the summer concerts are free to the public, just bring a blanket or a lawn chair and come prepared for some fun and good music! A renaissance woman in every sense of the word, my guess is that for Kristen’s teenage kids, having a mom that is a rock and roll singer is most likely embarrassing at the same time that it is ‘way cool’. For friends, neighbors, fans, please mark your calendars for May 30 and July 9. Come hear Cool Confusion and cheer on our local rocker mom as she’s lives her dream – you won’t be disappointed! Wilson Farm Park Gazebo Dedicated to Judy DiFilippo! 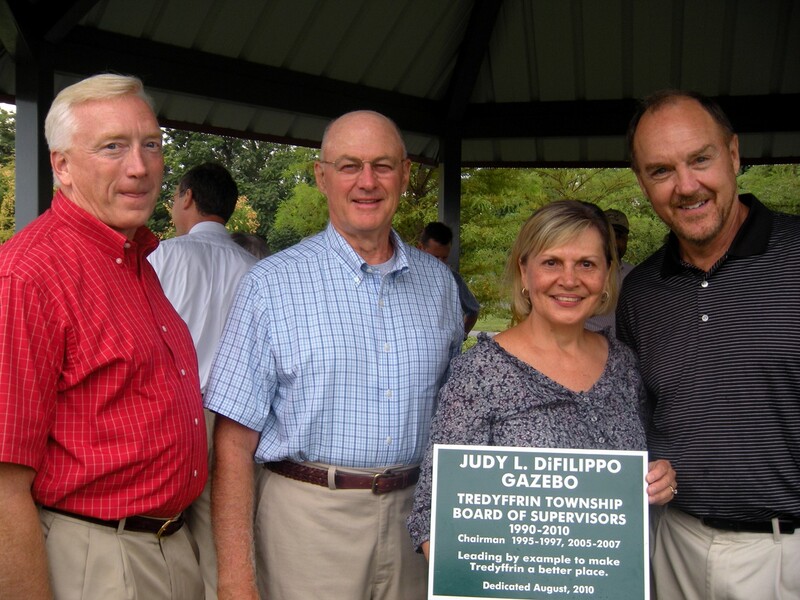 Yesterday’s threatening sky and a few raindrops was not going to keep members of the community from thanking Judy DiFilippo for her 20 years of public service to Tredyffrin as a township supervisor. Judy had the vision for Wilson Farm Park so it was only fitting that the park’s gazebo was named in her honor. Providing accolades for the occasion was Joe Barks from the township’s newly formed Parks & Recreation Foundation and Jack Edson and Jack Trimmer of the Parks & Recreation Board. Tredyffrin Township supervisors Olson, Richter, DiBuonaventuro and Kampf joined former State House Rep Carole Rubley, current State House Rep Paul Drucker, Chester County Commissioner Terence Farrell, T/E School Board member Debbie Bookstaber and Assistant Director of Chester County Planning Commission David Ward at the dedication. Public Works Director Steve Norcini, township Parks and Recreation Director Hillary Mallory and township Inspector Mike Pilotti also attended as did several members of the township’s police department. Family and friends joined in the celebration. 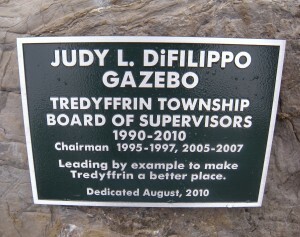 The appropriate inscription on the gazebo plaque reads, “Leading by example to make Tredyffrin a better place”. The next time you are Wilson Farm Park, I hope that you take the time to stop by and see the newly named gazebo. 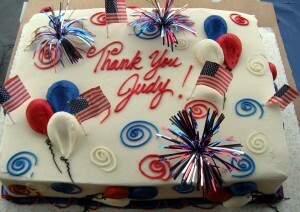 An honor well deserved, we thank Judy for her many years of service to our community! Judy DiFilippo . . . Leading by example to make Tredyffrin a better place! Reminder: Gazebo Dedication Today @ 3 PM — Please attend as Judy is honored! 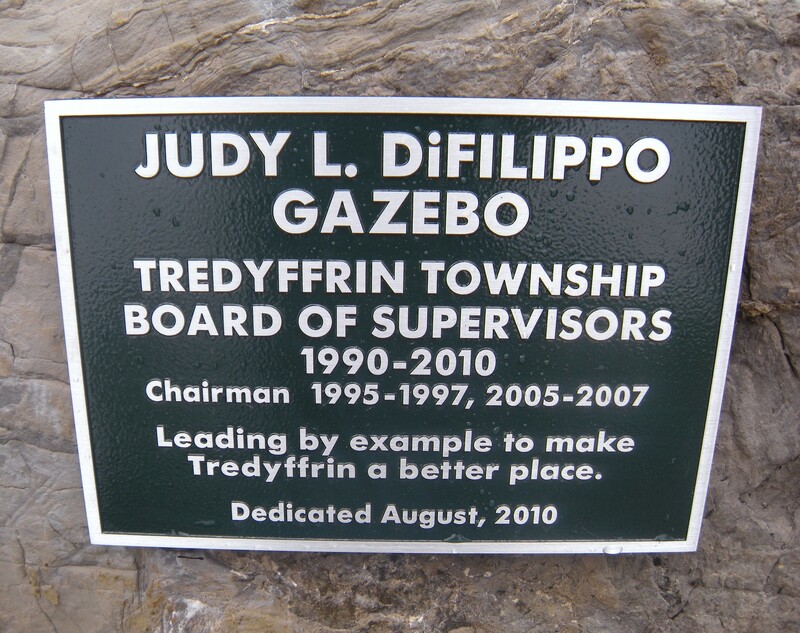 ‘Leading by example to make Tredyffrin a better place’ describes former township supervisor Judy DiFilippo and are the words chosen as the inscription for the gazebo to be named in her honor, at Wilson Farm Park. The dedication and reception will take place this Sunday, 3 PM at Wilson Farm Park. This special recognition is to honor Judy’s work in creating Wilson Farm Park and also to thank her in a very small way for her 20 years of public service to the township as a supervisor. My friendship spans 20+ years with Judy and I cannot imagine a more deserving person for this honor. She may have retired from the Board of Supervisors, but her volunteer efforts continue . . . Judy is on the board of the Tredyffrin Historic Preservation Trust and is helping raise the necessary remaining funds for the rebuilding of the Jones Log Barn at DuPortail. Together, she and I will be again co-chair In the Mood, the Trust’s annual fundraiser (Friday, October 22). I hope that you will take a break from your summer activities and join me at Wilson Farm Park on Sunday afternoon to celebrate a very special person — my friend . . . Judy DiFilippo! Last night’s Board of Supervisor meeting went very quickly. A few updates — The newly formed Sidewalk Committee and the Stormwater Committee are both going to meet this month. On the subject of the Sidewalk Committee, there were a couple of residents who live on Upper Gulph Road (close to N. Wayne Ave.) who spoke about sidewalks on Upper Gulph Rd. Neither were fans of sidewalks on their street; explaining that their houses are very close to the road, and in one case a sidewalk could come so close as to effect the foundation of their historic house. The gentleman with the historic home told the supervisors that a sidewalk would come within 5 ft. of his house and that if a sidewalk was planned for his section of Upper Gulph Rd. he would expect that the township purchase his house. He distributed photos of his house to the supervisors to make his point. He also mentioned some email circulating in his neighborhood about sidewalks on Upper Gulph and Paul Olson, . . . I didn’t understand that comment or its significance. Perhaps someone can offer clarification. Mt. Pleasant was discussed under new business by the supervisors. In Mimi Gleason’s absence, Assistant Twp Mgr Tom Scott updated on Mt. Pleasant. He explained that the demolition had started for the Henry Ave. townhouse development. It was obvious that Mr. Scott had not visited Mt. Pleasant because as I have previously indicated on Community Matters all 4 vacant, abandoned houses are now down and rubble removed at the future townhouse site. Discussion continues on the Mt. Pleasant Ave. vacant lot; Mr. Scott mentioned that the Chester County Health Department has been notified and there will be follow-up with that organization. On the subject of the student housing ordinance, discussion is ongoing. Supervisors DiBuonaventuro and Kichline both spoke about the ordinance and encouraged the residents to get involved in that process and to review neighboring municipality ordinances. Mt. Pleasant residents Donna Shipman and Christine Johnson both presented personal comments on their neighborhood; and thanked those involved for attending the town hall meeting. There are positive changes in Mt. Pleasant and I am encouraged. As an aside, following the meeting, Bob Lamina thanked me for posting the photos of Mt. Pleasant; confirming my belief that pictures do speak a 1,000 words. Another topic of discussion last night . . . everyone should be aware of the upcoming clean-up Tredyffrin days on April 17 and 18, 9 AM – 3 PM. I encourage everyone to get involved in your community. We all know that is was a very long, hard winter and major clean-up is required to get our neighborhoods back in order. Even if you only have an hour or so to spare, please consider helping with this worthwhile community event . . . Tidy Up Tredyffrin Day! One of the highlights of the Board of Supervisors meeting was brought up by Supervisor DiBuonaventuro. On behalf of the Parks Board (he serves as the Board liaison) DiBuonaventuro asked Chairman Lamina about furthering the process to have the gazebo at Wilson Farm Park officially named for former supervisor Judy DiFilippo. Some of you may recall, that upon the opening of Wilson Farm Park, the Parks Board had asked that the Board of Supervisors officially name the gazebo after Judy for her hard work and dedication in making the park a reality. At the time, the decision was made not to move forward on the dedication because Judy was a serving supervisor; rather they made the decision to postpone further discussion until the time Judy was no longer a supervisor. I’m excited to report that the time has come . . . there will be a ceremony to dedicate the gazebo in Judy’s name. Biased as I am, I am hoping that we can make the dedication in to a very special celebration!